A True CIO and vCIO are fundamentally different. Increasingly, mid-size businesses are outsourcing their IT support functions such as help desk, server and network management to an IT Managed Service Provider (IT MSP). Within their various service offerings, many of these companies also provide a function called vCIO, or virtual Chief Information Officer. They are not a True CIO. A true CIO is primarily a business leader first, someone who focuses on the strategic business needs of the enterprise, with experience in providing guidance on how technology can be used to achieve goals related to the top line and bottom line of the business. This type of capability is far beyond the reach of the IT MSP virtual CIO. The vCIO service from Managed Service Providers does not perform the same function as a true CIO. When examined closely, the vCIO role is actually more like a Senior Technologist; more concerned with assessing longer-term technology infrastructure needs of client organizations. To the degree that the person serving in the role is able to obtain information surrounding the technology needs from the client, they are able to provide a modicum of advice regarding the technology infrastructure needs only as it relates to the business. This presents a potential problem, given most business owners and non-technology executives are ill informed about their technology needs and how to manage their complete technology portfolio including technology infrastructure, business applications and business analytics. 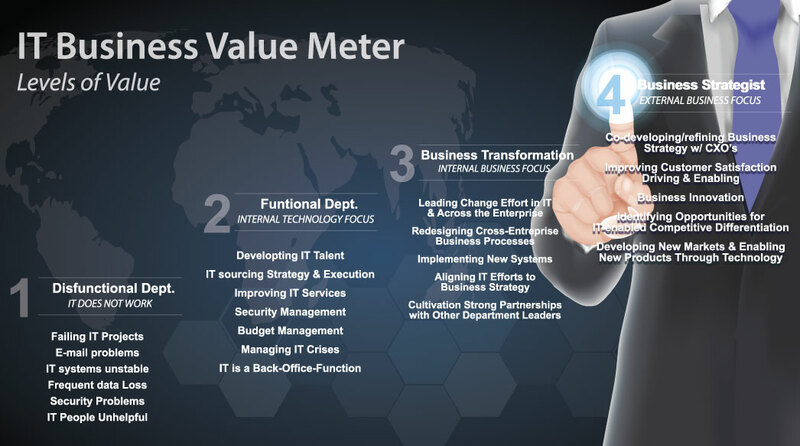 There is a large gap remaining, and this gap can only be fulfilled by a true CIO, internally or externally. No Conflict of Interest. Interests are always aligned with Company Management. A Consulting CIO provides independent assessment and oversight over outside technology providers, including MSPs. So, what’s the bottom line? The virtual CIO (vCIO) role offered by a Managed Service Provider (MSP) provides a much-needed function in keeping the technology infrastructure stable for the clients they support, helping networks become more secure and reliable. In contrast, the true CIO role fulfilled by VIE provides the business case for investing in forward-looking technology as it applies to the strategic objectives of the business. The proactive approach of a true CIO, whether part-time or full-time, helps the enterprise stay ahead of the curve, building for a greater future rather than fighting the fires created from misinformed technology decisions of yesterday.